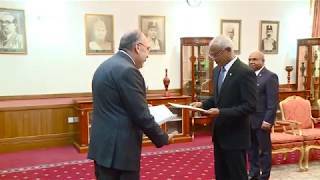 The Ambassador–Designate of Palestine to the Republic of Maldives, His Excellency Mr. Walid A.M. Abu Ali, presented his credentials to President Ibrahim Mohamed Solih at a ceremony held this morning at the President’s Office. President Solih welcomed the Ambassador to the Maldives and congratulated him on his appointment, and held a brief discussion on bilateral ties. The President noted that Palestine holds a special place in the collective heart of Maldivians, and recollected Maldives’ support for Palestine’s bid to gain formal UN recognition for its statehood. 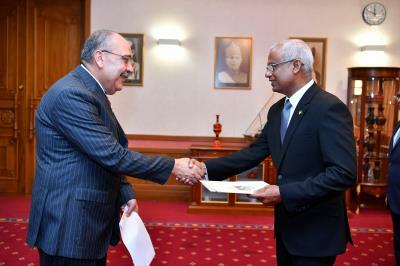 Ambassador Mr. Walid A.M. Abu Ali conveyed warm sentiments to the President on behalf of His Excellency, Mahmoud Abbas, the President of Palestine, and highlighted that it was his pleasure to be able to represent the people of Palestine in the Maldives. The Ambassador further reiterated his commitment to building on the friendly cooperation that has always marked our relations with Palestine, and conveyed his gratitude to the President for the support the Maldives has always extended to Palestine and its people.